My thanks to John Fraser for the photos and the match report. Haddington Athletic: Andrew Scobie, Mark Kelly, Scott Gilmour, John Saunders, Brian Martin, Jamie Connelly, David Anderson, Jackie Myles, Ross Ferguson, John Manson and Ryan Grant. Subs Ross Cowan, Derek Slight, Chris Inglis, Chris Moffat, Richie Marr. Penicuik Athletic: Mark Ramage, Graham Gallagher, Kris Steel, Matti Lynch, Brian Foster, Brian Ryrie, Dean Jones, Colin McDonald, Martin Cameron, Kevin Milne and Darren Moonie. Subs: Kenny Munro, Ross Montgomery, Keith Barr, Scott Gibb and Ryan Gay. The Athletics of Haddington and Penicuik met at Millfield Park in a South League Cup Section 4 match. The game went ahead in bright sunshine following some torrential downpours during the week. Haddington kicked off towards the pavilion and enjoyed the bulk of the early play without putting too much pressure on the Penicuik goal. Penicuik’s first real effort saw Scobie pull off a good save from a strong Cameron drive in the 11th minute. 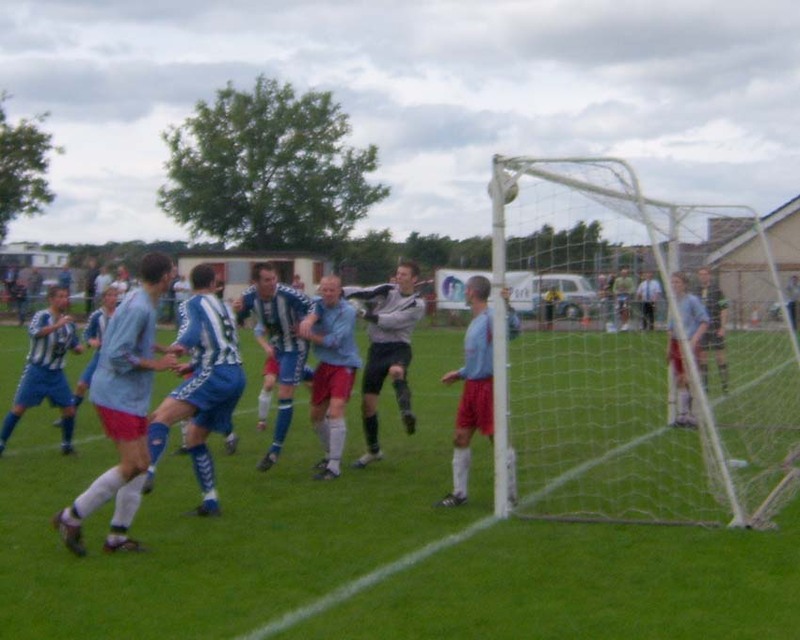 In reply, Scott Gilmour had a clear run down the left for Haddington but the Penicuik defence were able to clear. Penicuik were starting to apply pressure with some quick combined play and Haddington suffered a blow in the 22nd minute when Anderson left the field with an injury. The visitors took the lead in the twenty sixth minute when Milne released Jones up the right wing. McDonald headed his deep cross back across goal to CAMERON who side footed the ball home. Four minutes later Martin headed a net bound Cameron lob out for a corner as Penicuik kept up the pressure. The goal was only delayed as good play by Steel and Milne released Moonie into space on the left. When his cross came over JONES ran in to score Penicuik’s second. Milne and Ryrie were dictating play but Haddington’s defence stuck to their task. Scobie saved at Moonie’s feet and a last ditch Martin tackle robbed McDonald when he looked to be through on goal. Cameron had a drive deflected for a corner but Foster headed the resultant kick over the bar. Myles was booked for a late tackle before Haddington finished the half with a flourish. Chris Moffat won a corner that was deflected out and Haddington could not capitalise on the second corner before Referee Ross blew for half time. Penicuik went in for their half time refreshment having put on a strong display of possession football in the first forty five minutes. Haddington changed their formation to counter Penicuik’s midfield dominance and Manson and Grant caught the eye with some determined play. With five minutes of the second half gone, Haddington drew a goal back when Mark Kelly found himself clear on the right wing. His deep cross looked net bound but ROSS FERGUSON headed the ball in to an empty net to bring the home team right back into the game. Foster sliced the ball out for a corner and Cameron gave a free kick away in a dangerous position as Penicuik struggled to get any rhythm into their play in the second half. However, Penicuik hit back in the 57th minute when a Cameron header came back off the crossbar following two Moonie corner kicks. 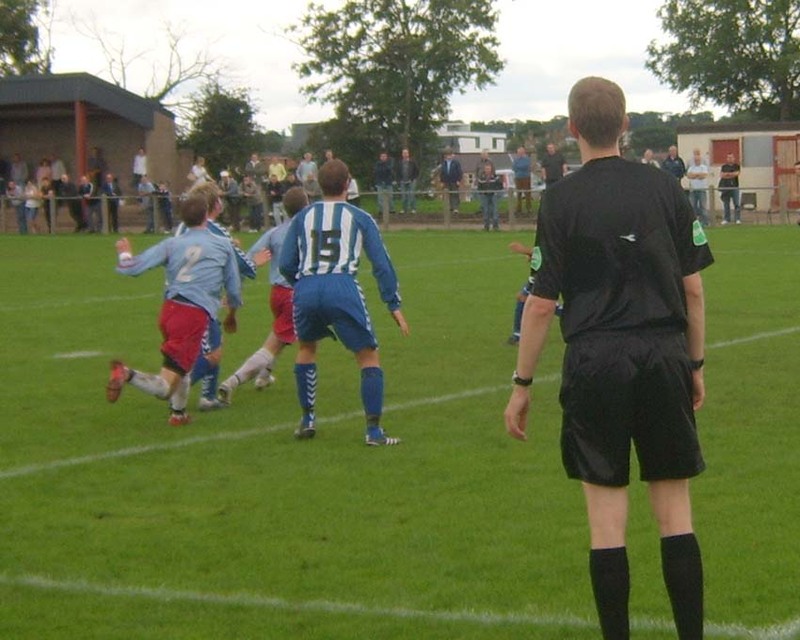 Penicuik replaced Milne with Barr as Haddington went looking for the equaliser. Lynch was yellow carded for a midfield challenge before a drive by the hard working Manson was held by Ramage in the visitor’s goal. With 20 minutes of the half gone, Scobie saved at Barr’s feet after good play by Cameron and McDonald. A last gasp tackle by tenacious home defender Saunders denied Cameron when he was running in on goal. 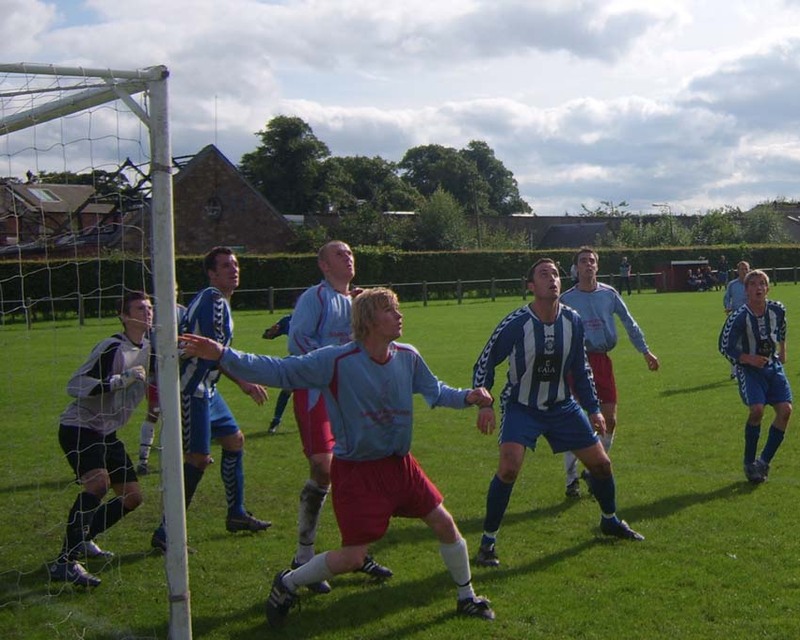 Montgomery replaced Moonie as Penicuik again held the upper hand. A Ryrie drive was deflected for a corner before the Penicuik midfielder set up the third goal in the 76th minute. He won the ball in midfield and passed for McDonald to run into space on the left. CAMERON was on hand to net McDonald’s square pass with the Haddington defenders vainly claiming for off side. With the game over as a contest, there was one unusual incident before the end. Ryan Gay replaced Dean Jones in the 78th minute and was booked 6 minutes later for having come onto the field of play without the referee’s permission. In the final act of the game substitute Ross Cowan almost added a second goal for Haddington but his drive sneaked past the wrong side of the post.